I'm generally not a fan of overhead or generic lighting solutions. Especially when accompanied with lamp shades in the eggshell white category -- the thought of it makes me shudder. Does that sound pretentious? Perhaps. But the point I'm driving home here is that there are so many other more attractive and, better yet, economical and environmentally-friendly options available. Lighting has the potential to play a pivotal role in the look of your room. Whether it may be a statement piece or a shade with bold colors and lovely textures, each lighting element can accent the design of your room. There's something so much more welcoming about having accent lighting to soften the room as opposed to the bright and often abrasive light given off by some overhead lights or ceiling fans. This past summer I dreamt up an idea to create a custom chandelier to be used as a focal point in my apartment. I loved the weathered look of old blue and clear Mason Jars and wanted to incorporate them in my design. To create the Mason Jar chandelier I enlisted the help of my uncle in navigating the electric work for the chandelier. The design I created required eight 32oz Mason Jars in alternating colors (blue and clear). To begin, my uncle began by cutting a 13" circular piece from wood and painted it to match the electrical cord. Each jar cap was then punctured to allow for a custom made socket (sized to fit a 40 watt bulb). It was important to use a lower wattage in the construction of this piece because a higher wattage would run the risk of overheating the jars (even with holes punctured in the jar lids). Once the sockets were attached, we strung the electrical cord through the wooden circle and spliced the cords to attach to a singular power source. To finish, I evenly staggered the jars to create a spiral effect and let the constructed chandelier sit with the bulbs on for about a half hour to stretch out the electrical cord. The chandelier now hangs in my apartment as a predominant focal piece. I don't think I could ever get sick of it. It is a large element of my entryway, hanging 3' off the ground and stretching 6' long. Since creating this piece, I have explored other options for creating re-purposed lighting. I doubt this will be my last lighted creation. 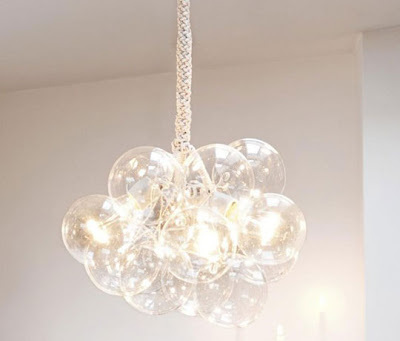 Recently, I found a tutorial for a whimsical DIY bubble chandelier on Apartment Therapy. It is the perfect piece to hang in a dining room or and entryway and is a fraction of the cost of a comparable chandelier purchased at a store. I was enthralled with the off-the-shelf approach to the design. Here's to lighting inspiration!